On this International Workers Day in the US, we are witnessing a rising trajectory of labor’s class struggles. In the latest issue of Anti-Capital, it was observed that there is the makings of a strike wave in the United States after the simultaneous statewide strikes by K-12 public school workers and Frontier Communications workers in West Virginia. The context of this rising trajectory is the objective conditions of capital and the accelerating resistance of workers to the political and social upheavals that have been framed by the crisis of 2007-08 and escalated by the barbaric police violence, the fascist street demonstrations and the elections of 2016. Struggles occur in the streets, in the workplaces, in the neighborhoods. Hard numbers are difficult to find at this time, but with the statewide strikes in West Virginia, Kentucky, Oklahoma, Arizona and the long list of small and local strikes across the country, we are approaching or have surpassed 100,000 workers on strike in the United States since January 2018. An unknown number of workers have made strike threats or have won their demands on the back of the strike threat. Some examples include Pittsburgh teachers, Dayton school bus drivers and New England healthcare workers. An unknown number of workers are on the picket lines with the only media coverage being the most local of local news affiliates. An example is the factory workers at the Tecnocap plant in Glen Dale, West Virginia. Since early March, production workers have been locked-out. As of late April, the skilled trades workers in the plant have gone on strike and joined the production workers on the picket lines. If you read the labor relations paperwork connected with the workers’ struggles at Tecnocap, you get a lesson in chiseling. Charges and counter-charges, blatant disregard for both the law and the contract; last year, the company refused to even send a representative to an arbitration hearing because they decided they didn’t have to. Their legal opinion was that they make the rules. But you wouldn’t know it unless you were a local resident or stumbled across the scant coverage. Other examples include small units of healthcare workers in Pennsylvania and private club workers in California. Education funding is a major demand in each of these statewide struggles, captured in the teachers’ slogan: working conditions for teachers are learning conditions for students. Such demands are general and social, affecting the entire working-class. Demanding that they be funded through raising taxes on corporations and the rich represent the class instincts on display in such struggles. 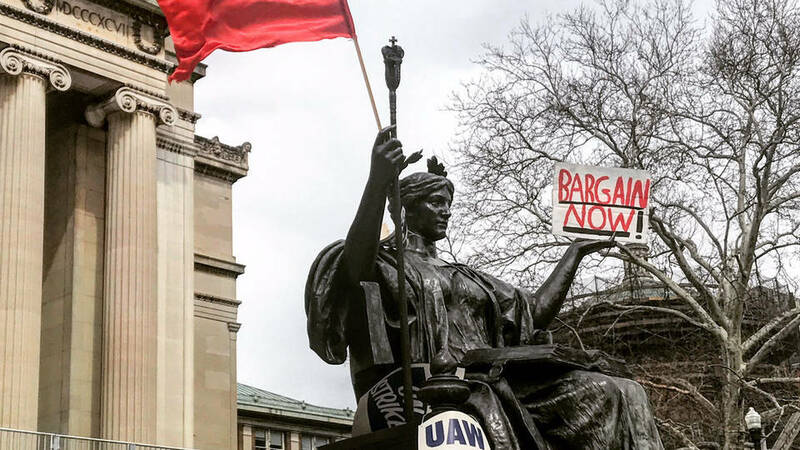 At the same time that the strike wave is developing, there’s been a spike in unionization campaigns. From 5000 JetBlue airline workers to 400 Albanese candy workers to 12 journalists at New Republic, in numbers large and small, workers are organizing. The AFL-CIO seems surprised by this. In the 2 months since the statewide strikes in West Virginia, the trajectory of labor’s class struggles continues to rise. Another large group of workers is slated to begin striking next week, involving 24,000 healthcare workers in California, while Colorado is the scene of the next statewide public school worker strike. The contours of the class struggle for the working-class in America remain essentially the same as was reported in Anti-Capital last year on May Day 2017. I The degradation of black labor: expressed in police murders and militarized police occupations, the rolling back civil rights protections and reinforcement of the social structures which maintain precarity and poor working and living conditions for black people. II The criminalization of immigrant labor: expressed in the passage of anti-immigrant legislation, the expansion of ICE and law enforcement (in every way) and the increasing nativist and jingoist political climate. III The chiseling of organized labor: expressed in the passage of anti-union legislation, anti-labor judicial precedents, the attacks on multi-employer defined benefit pensions and capitalist resistance to prevailing wage laws. The unification of these fronts forms the material basis for a workers’ party in the United States today. Simultaneous general attacks by capital against large segments of the working-class have created the objective conditions for this unification. Socialist intervention in the class struggle must be rooted in the organic growing-over of these fronts. This growing-over is evident in the movement of trade unions to become “Sanctuary Unions” that explicitly defend the interests of immigrant workers as immigrant workers; in the functional unity of the Black Lives Matter and Fight for 15 social movements; in the introduction of wage and trade union demands into the fight against voter suppression; etc. Such examples show that labor’s class struggles can trend toward this growing-over, and provide us with a point of entry for definitively socialist demands that represent the interests and needs of the whole class. So far, the Democratic Party has not been able to assert itself as the representative of the striking workers’ demands. It has not offered support to immigrant labor in the wake of Trump’s election. It has not moved to defend the rights of black people. While it is likely that there will be significant support for Democratic Party politicians from workers, particularly public sector strikers and trade union members in the midterm elections 6 months from now in November 2018– as was seen in the reaction against the party of Trump in Pennsylvania’s 18th congressional district by working-class voters in March 2018 and the support for demagogic Democrats like Ojeda in West Virginia during the public school strike– such support will be contingent and ephemeral. Political volatility will continue regardless of how strong the Democratic Party shows in the polls. With the election of Obama in the wake of the 2007-08 crisis, a durable New Deal-style coalition did not emerge, despite the predictions of many people across the political spectrum, because the conditions for it did not exist. Domestic American politics, like that of other nations around the world, continues to become increasingly volatile, making such a durable coalition– including labor– an impossibility. For the working-class, this means that the lack of a traditional political mechanism for the recuperation of workers’ struggles and workers’ organizations leaves the field open for class politics. The rising trajectory of labor’s class struggles and the further development of trends evident in the working-class since 2016 demonstrate that the social atmosphere is far more fortuitous for the working-class and its revolutionary minority than it was on May Day 2017.